Overall the book has a good pace and doesn’t bog you down with too much information. There are interesting characters with room to grow and relationships to grow along with them. There’s banter and witty comments galore to keep you chuckling and begging for more. It is a cool plot, a teenage mediator who helps ghosts move on to the afterlife. This actually reminds me of the Buffy show. I also really like that some Spanish Conquest history has been thrown in. Sussannah is the protagonist of this story and a 16 year old teenager. I am going to call her Suze because I’m not her mother. Suze is witty, snarky and sarcastic and it is wonderful. Suze is one of those people that always has a comeback. Unlike me who’s like if someone says I’m gonna smack you my reply will be you try that. And then later I think I should’ve said you try that and I’ll smack you into next week and it’s only Monday! I also really like that Suze’s propensity for violence; she can and does get physical with ghosts. Jesse is a Spanish guy/ghost dead 150 years. He hadn’t talked to anyone in awhile but he was still pretty snarky. I loved learning about his backstory and interested to learn more about it because we seem to know most of it but it also seems like there is more to the story. And the interaction between Jesse and Suze was great. They seem to compliment each other really well and push each other out of their comfort zones. And the banter between them makes the book. 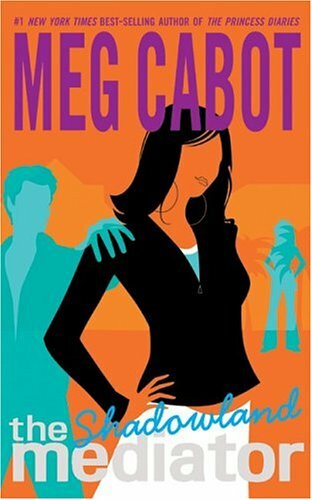 Meg Cabot really seems to have gotten into the mind of a teenage girl and she has so many great one liners and they especially hit a chord with me because they are things I thought of back when I was a teenager…… back with the dinosaurs. I didn’t quite understand how the title fits in- is it because Suze works in the shadows or is it where the ghosts go when they pass? But my main dislike in the book was that in the end to get rid of Heather, Suze had to do an exorcism. As Father Dominic points out that is not what they do as mediators. But I do understand that Heather was a threat that needed to be taken care of. But it still kind of feels like she failed. At least Suze has 5 more books to try again since there are 5 more books in the series! – My favourite part of the book was Doc/Dave figuring out what Suze is and what she can do. At least Suze will have some family support whether she wants it or not. There are 6 books in the Mediator series: 1. Shadowland, 2. The Ninth Key, 3. Reunion, 4. Darkest Hour, 5. Haunted, 6. Twilight. So I give this book 4 out of 5 stars I recommend you read it! I plan to go find and buy the rest of the series now…. So catch you all later! The Crown’s Dog by Elise Kova Cover Reveal!